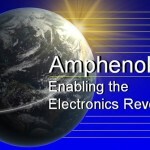 Home → Uncategorized → Welcome to Amphenol! Although you may not see them when you pick up your smart phone, touch screen tablet or e-book reader, Amphenol products are more than likely inside. Our wide range of miniaturized cables, flex circuits, hinges, and antennas has enabled the proliferation of wireless devices, helping give people access to information virtually everywhere in the world. Customers have selected our products on more than 50% of the world’s mobile devices.